Austro-Italian family, originally from Marburg, Styria. 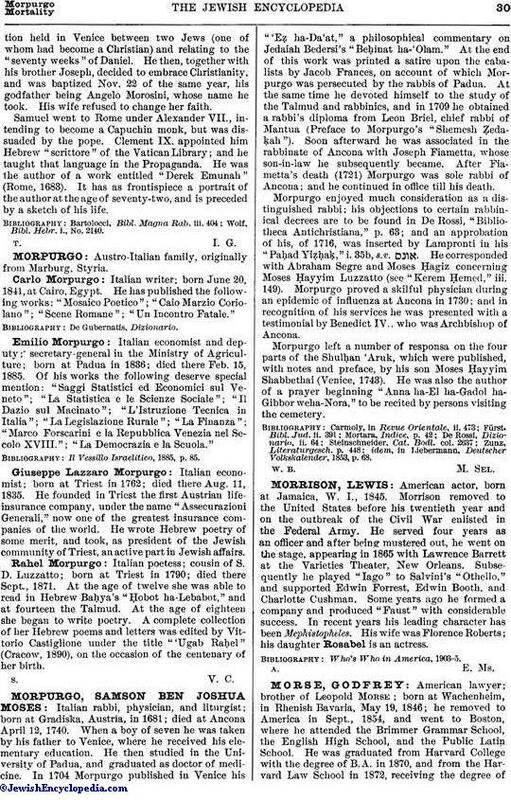 Italian writer; born June 20, 1841, at Cairo, Egypt. He has published the following works: "Mosaico Poetico"; "Caio Marzio Coriolano"; "Scene Romane"; "Un Incontro Fatale." Italian economist and deputy; secretary-general in the Ministry of Agriculture; born at Padua in 1836; died there Feb. 15, 1885. Of his works the following deserve special mention: "Saggi Statistici ed Economici sul Veneto"; "La Statistica e le Scienze Sociale"; "Il Dazio sul Macinato"; "L'Istruzione Tecnica in Italia"; "La Legislazione Rurale"; "La Finanza"; "Marco Forscarini e la Repubblica Venezia nel Secolo XVIII. "; "La Democrazia e la Scuola." Il Vessillo Israelitico, 1885, p. 85. Italian economist; born at Triest in 1762; died there Aug. 11, 1835. He founded in Triest the first Austrian life-insurance company, under the name "Assecurazioni Generali," now one of the greatest insurance companies of the world. He wrote Hebrew poetry of some merit, and took, as president of the Jewish community of Triest, an active part in Jewish affairs. Italian poetess; cousin of S. D. Luzzatto; born at Triest in 1790; died there Sept., 1871. At the age of twelve she was able to read in Hebrew Baḥya's "Ḥobot ha-Lebabot," and at fourteen the Talmud. At the age of eighteen she began to write poetry. A complete collection of her Hebrew poems and letters was edited by Vittorio Castiglione under the title "'Ugab Raḥel" (Cracow, 1890), on the occasion of the centenary of her birth.